Orla O’Sullivan is a member of the Anne Sullivan Foundation Advocacy Working Group in Cork who advocate for the wider community of people who are deafblind in Ireland. 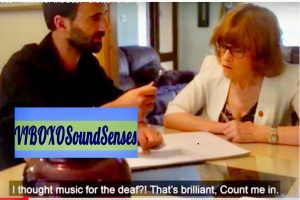 Orla is developing VIBOXO SoundSenses and is keen to get feedback from the community. Orla will demonstrate the VIBOXO SoundSenses test rig at the Anne Sullivan Centre, Stillorgan, Co. Dublin, on Tuesday 29th January 2019 at 1.30pm. On the day, there will be a chance for you to try out VIBOXO SoundSenses for yourselves. The VIBOXO test rig converts sounds into vibrations and visual colours. You put your hands or feet on the pad to feel the vibrations, while on-screen the vibrations are converted into visual colours. For people who are deaf, deafblind and everyone else it will teach perfect musical timing for dancing, ISL/tactile signing and singing. VIBOXO has three parts (vibrations, colour and sound) that work together in perfect musical timing. The settings allow you to control the sound volume and the vibration intensity. It can be used by everyone for musical education, entertainment and therapy. lmartin@annesullivancentre.ie or 087 645 7586.